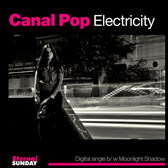 Canal Pop releases "Electricity" as a single, backed with a cover of "Moonlight Shadow". "Electricity" was chosen by Canal Pop to be released as a single from the EP High Class Girls & Lo Fi Boys. The single contains a B side, a version of the 80's hit by Mike Oldfield "Moonlight Shadow". In 2011 the song "Electricity" was included in the Face The Beat compilation released by Side-Line/ Alfa Matrix, Belgium, being Canal Pop the only Argentinean artist. The single will be an exclusive Bandcamp.com release until September 24, 2012 at US$ 0.99. Then it'll be available at the rest of the digital stores. The Bandcamp.com version comes with an 8-page virtual booklet with pictures taken by Marcia Hill.